Originally titled The Clansmen, after the novel of the same name by former North Carolina Baptist Minister Thomas Dixon, Jr. (1905), The Birth of a Nation is one of the most important and controversial films ever to hit the silver screen. It was the first 12-reel film released in the United States, and it was the first to be screened in the White House for President Woodrow Wilson who said it was “like writing history with lightning.” It was the first to utilize various techniques like panning and color tinting and intercutting/cross cutting and continuity editing (utilizing continuous space and time, and progressively increasing the length of cut scenes to build tension), and the first to employ a full musical score to be played along with the film. When it was complete, the film was released in two parts. Part I: Civil War America. The opening title reads: “A Plea for the Art of the Motion Picture: We do not fear censorship, for we have no wish to offend with improprieties or obscenities, but we do demand, as a right, the liberty to show the dark side of wrong, that we may illuminate the bright side of virtue-the same liberty that is conceded to the art of the written word-that art to which we owe the Bible and the works of Shakespeare.” Part I introduces the audience to two families just before the outbreak of the American Civil War: The Stonemans –a northern family whose father, Austin Stoneman, is an abolitionist congressman whose character is clearly based on Thaddeus Stevens with two sons and a daughter named Elsie; and also the Camerons –a Southern family from South Carolina with two daughters, Margaret and Flora, and three sons, the most important being Ben Cameron. In the beginning, The Stonemans visit the Camerons and embrace as old friends –Ben Cameron falls in love with Elsie Stoneman- but when the Civil War begins, the young men go join their respective armies, north and south. A title reads: “The bringing of the African to America planted the first seeds of disunion.” A rowdy black militia attacks the Cameron house but it is rescued by a Confederate group of soldiers who chases the militia away. Later, Ben Cameron is injured at the Siege of Petersburg but he is rescued by Union soldiers who see him caring for a Union soldier. While still recovering, Elsie Stoneman cares for him in a Washington hospital, but the colonel informs him that he will be hanged for being a guerilla which leads the matriarch of the Cameron family to appeal to Abraham Lincoln or, “the Great Heart”, to release Ben Cameron. Mr. Lincoln obliges her wish and he also begins a process of rebuilding the South until he is assassinated on April 14, 1865. After Lincoln’s assassination at Ford’s Theatre, which was filmed on an outdoor set, Austin Stoneman and other radical congressmen decide to punish the South and push forward new legislation privileging black Americans. 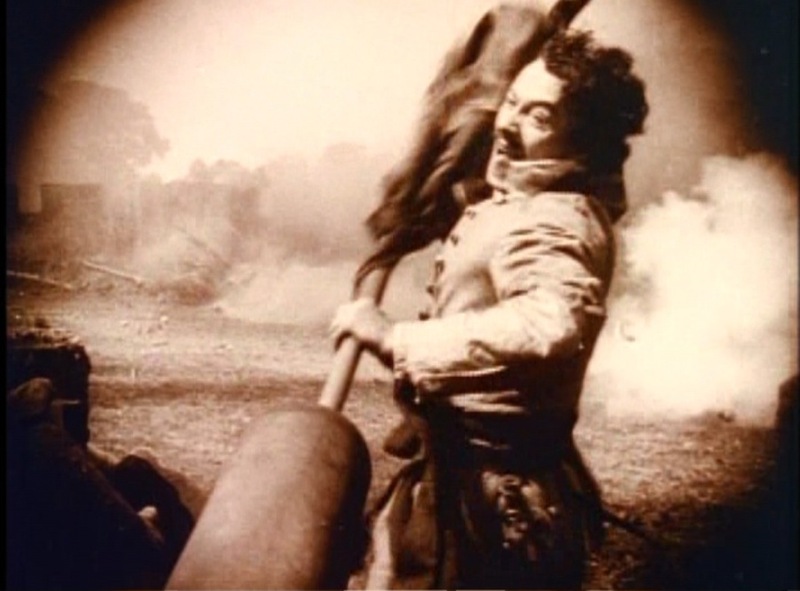 The Birth of a Nation was the highest grossing film of the silent era. To see it in a New York theatre cost $2.00, which is the equivalent of about $17-20 today. There was no script or notes written down for the film, Griffith had it all in his head and it was filmed on the present day Universal Studios property. Starring: Lillian Gish “The First Lady of Cinema” (Elsie Stoneman) who is rumored to have had a romantic relationship with Griffith, so he let her choose her own theme song in the score later called “The Perfect Song” for her character Elsie, and she went on to star in other acclaimed Griffith films including Intolerance, Broken Blossoms, Way Down East, and Orphans of the Storm; Mae Marsh (Flora Cameron) who also starred in other Griffith films such as Intolerance, Man’s Genesis, and The Sands of Dee; Henry B. Walthall (Ben Cameron) who moved out to California with Griffith when he parted ways with Biograph but later left Griffith to appear in other major films; Miriam Cooper (Margaret Cameron) who Griffith told in one scene that her mother had just died to make her act more upset; George Siegmann (Silas Lynch) and Walter Long (Gus) both controversially acted in blackface. Other major names of cinema claimed to have unnamed parts in the film including John Ford, who claimed to portray a KKK member, Erich von Stroheim, and Milton Berle who said he was a child in the film. The film was accused of racism by the NAACP, which in response, organized large-scale riots and protests in major US cities. They even got the film banned in major cities including Los Angeles and Chicago. The film is also often credited with bringing about a resurgence of the Ku Klux Klan in the 1920s, which was revitalizing itself against blacks, Jews, Catholics, and immigrants. For years, The Birth of a Nation was used as a recruiting tool for the KKK and in some cases it is still used today. 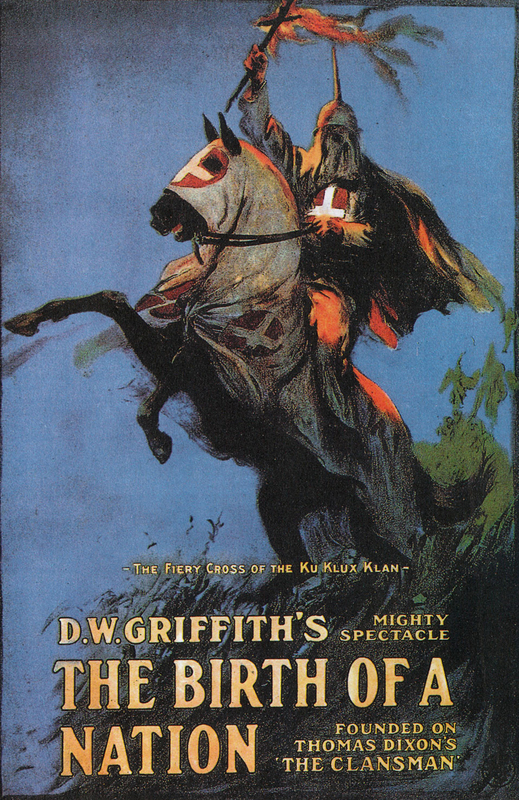 The portrayals of African Americans as devious, licentious, and lazy subhumans led to numerous accusations of racism against Griffith, who furiously denied the accusations with his next film, Intolerance (1916) which was intended to be a response to the public outcry against The Birth of a Nation. He also published a pamphlet entitled “The Rise and Fall of Free Speech in America” (1916). Lillian Gish went to her grave denying that the film was racist. Many of the Civil War scenes were based on photographs, but the Reconstruction scenes in part II were based on political cartoons, such as the legislature scenes. The battle scenes were filmed in the San Fernando Valley in California. During Lincoln’s assassination at the reconstructed Ford’s Theatre, Griffith had the actors perform lines from Our American Cousin. At the film’s premiere in Los Angeles, D.W. Griffith hired the Los Angeles Philharmonic Orchestra to play the entire score for the film, synchronized with the scenes. Louis B. Mayer eventually (of later MGM) purchased the state’s distribution rights, which allowed him to get into the film business along with other businesses that were forming: Mutual Film Corp., Triangle Film Corp., and Paramount Pictures. The original budget was $40,000; then $60,000; and finally Griffith was forced to seek out new investors until the film finally cost $110,000 to make. The Birth of a Nation was one of the biggest box-office hits in cinematic history and it continues to be a controversial influence to this day. Griffith was born and raised in La Grange, Kentucky as the 7th child in his family, and his father served as a colonel in the Confederate army. After his failure to sell a script to Edwin S. Porter of Edison Studios under the pseudonym of Lawrence Griffith, Porter hired Griffith to star in Rescued from an Eagle’s Nest. Later, Griffith joined Biograph studios where he filmed the first movie in Hollywood, California –In Old California. When Biograph stopped supporting his film ventures, he formed his own studio in California as Reliance-Majestic Studios, which dissolved after the box-office flop of Intolerance. Griffith, along with Douglas Fairbanks, Mary Pickford, and Charlie Chaplin formed United Artists but Griffith fell into obscurity after his major films were released in the 1910s. Griffith had previously produced and directed Biograph’s The Rose of Kentucky (1911), which portrayed the KKK as a villainous organization, and this was his defense against accusations of racism. The Birth of a Nation is a technical and cinematic masterpiece. It was a dynamic leap forward in the possibilities of the new medium of film and it has been a foundational piece of work for every great director since. If the audience can look beyond the blatantly racist message of the film, and appreciate the powerful techniques employed, the film becomes just as important, if not more so, than other controversial films, such the Battleship Potemkin or Triumph of the Will.